It can be difficult to not lose your washi tapes amidst your crafting stash so today, we thought we’d help solve that problem for you with Maxine’s step by step tutorial! You only need a few, handy products and soon you’ll have your very own washi tape box sitting proudly on your craft desk. 1. Print the free Washi Tape box template, draw around it onto an A4 sheet of white Dovecraft cardstock and cut out. Score along the lines indicated on the template and adhere the flaps with glue to create the box. 2. Cut out two tabs from your template, draw around them onto an A4 sheet of white Dovecraft cardstock and cut out. Score along the designated lines and glue the two tabs together to make a T shape. On the left hand side, measure half way down your box and adhere the longest length of the tab to the inside of your box. Repeat this step to create an identical tab for the opposite side. TIP: If your printer takes card, print your template straight onto your sheet of Dovecraft Cardstock to save time. 3. Cut a 14cmx9cm strip of Dovecraft acetate, roll the strip together to make a tube and to hold it in place, use Dovecraft Perma Fix Tape to ensure that it is secure. Choose four or five washi tapes and slide these onto your tube, then carefully fit the tube onto the tabs on the inside of your box. TIP: Check that your washi tape will fit onto the tube and on the fitted tabs before permanently sealing your acetate tube. 4. Decorate your box as you wish, we have used Dovecraft Washi Tape to decorate our box, alternatively you could cut pieces of backing paper and adhere to the box with glue. 5.Take an old cling film box and carefully remove the plastic cutting strip. Cut it down to 9.5cm and securely adhere it to the bottom of the box, ensuring that the cutting edge is facing out at the front of your box. TIP – Make sure when you adhere the plastic cutting strip to the bottom of the box, to have the cutting edge slightly sticking out so that you will be able to effectively cut strips of your washi tape. 6. Die cut the words WASHI TAPE onto Dovecraft glitter card. Stick the word WASHI onto the top of your box and the word TAPE along the front, with 3D foam pads. If you wanted a simpler look, remove the lid when making the box and have your washi tapes on display! Next time you consider throwing away an old cling film roll, think twice! You can turn so many household items into effective crafting projects and tools. 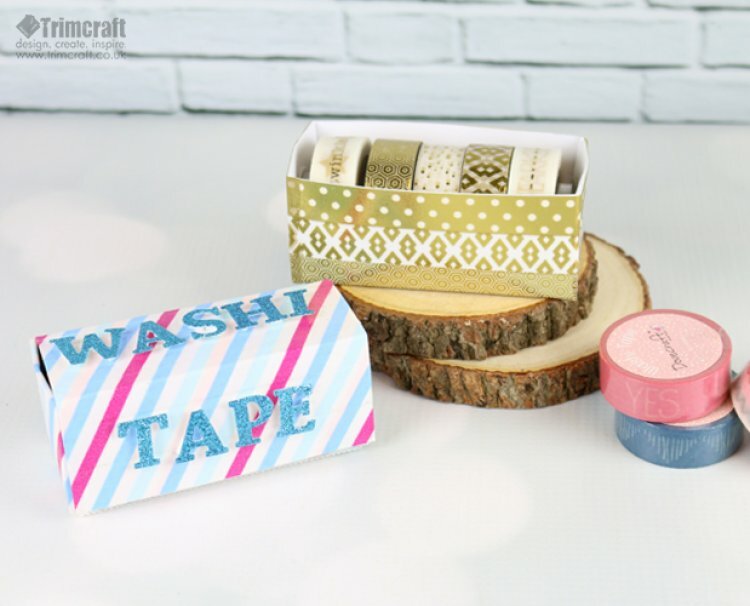 This washi tape dispenser will look great alongside your other crafting goodies, how will you decorate your box? Upload your brilliant crafts to the inspiration area and #Trimcraft on social media so we can have a look at what you’re making! Very good idea 😊 Like it, I have covered Tea boxes to put presents in before.